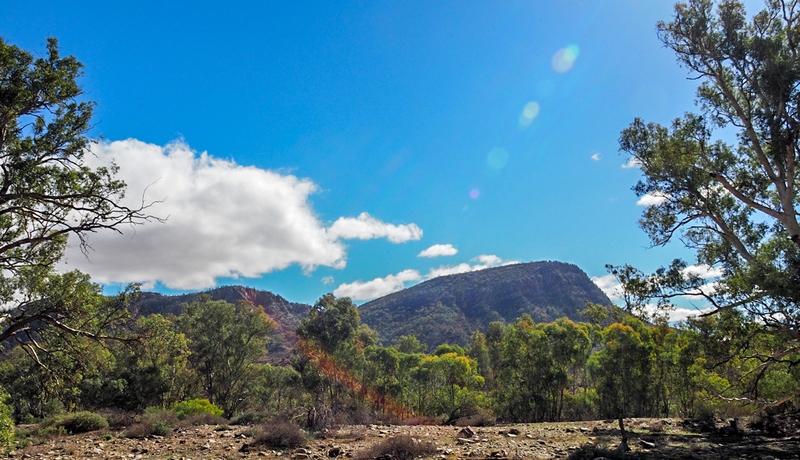 Sunday was going to be sunny, appropriately, but still windy, so we decided to drive through Bunyeroo and Brachina Gorges. 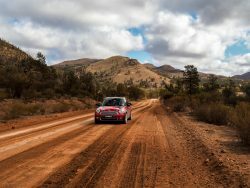 It was a wonderful drive with fantastic vistas, beautiful rocky cliffs, lovely massive old red gums and rock strewn creeks. How could you not enjoy it. 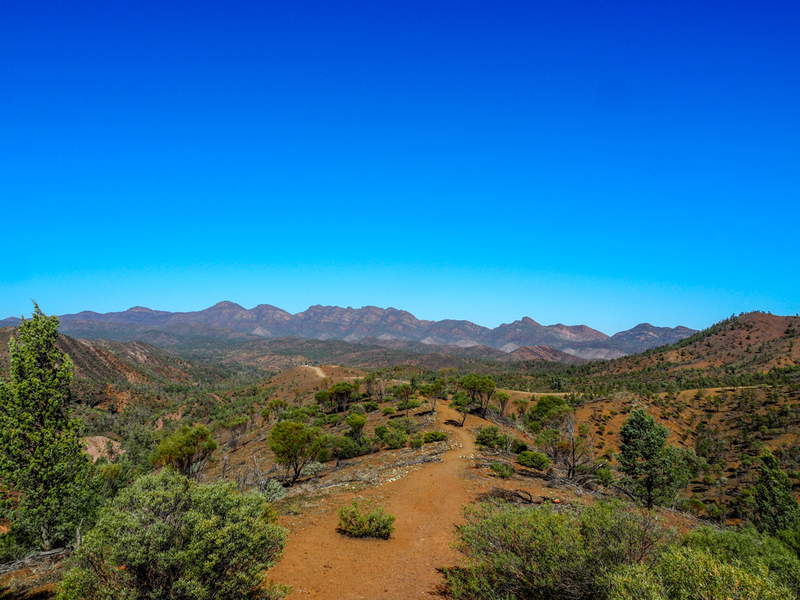 The view into Bunyeroo gorge was eye popping. The road through the gorge was rough and stoney but easy to drive. Then onto Brachina Gorge where a similar road took you through much higher cliffs and a wider gorge. I did put the drone up in the wind and was able to get a reasonable photo. 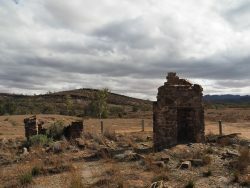 The ground level photo is of a different part of the gorge. 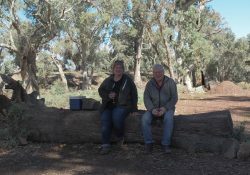 In the early 1980s we bush camped in Brachina Gorge with Jim and Jenny Ellis and their children, before there were any facilities, so we re-visited our camp site. 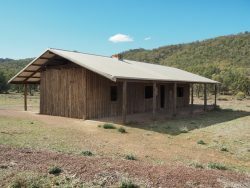 It was now set out with 5 defined sites, a drop toilet and not much else, but it was good to see it again. 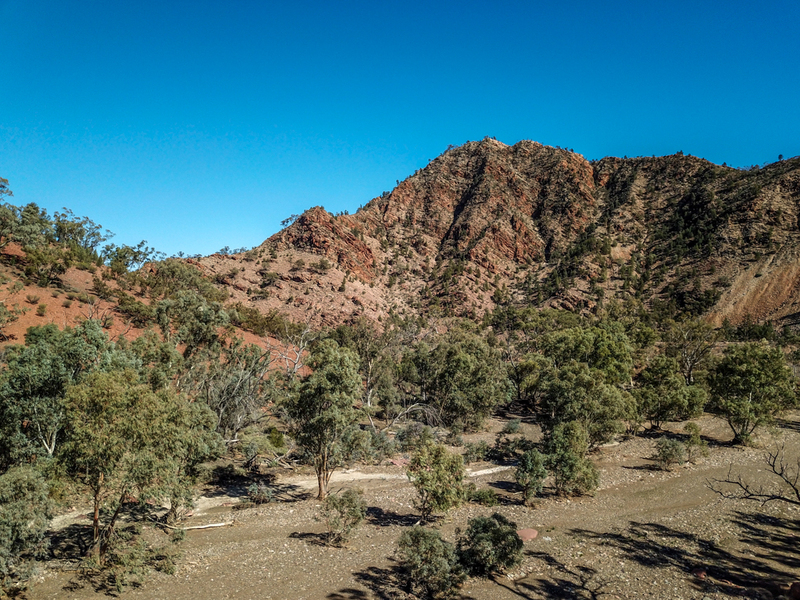 This photo is from our campsite and we all climbed the mountain in the photo. Nigel, a fireman ran up and down in 2 hours as part of his training for a charity round Australia run. He flashed a mirror to us from the top to confirm his achievement. You can just see the top af a hill to the left of the mountain, Jim and Peter Ellis and I spent hours trying to catch wild goats running up and down this hill. You could get very close, but they always skipped away at the last minute, I think they were having fun. Goats were in their peak at that time and since the 1980s 100,000 goats have been removed from the Flinders as part of Operation Bounceback, this is an amazing number and the bush is recovering as a result. 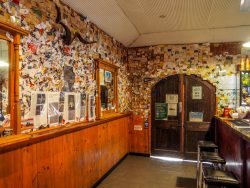 Possums and Quolls have been introduced recently. Deen and I had lunch in Brachina Gorge near our campsite. 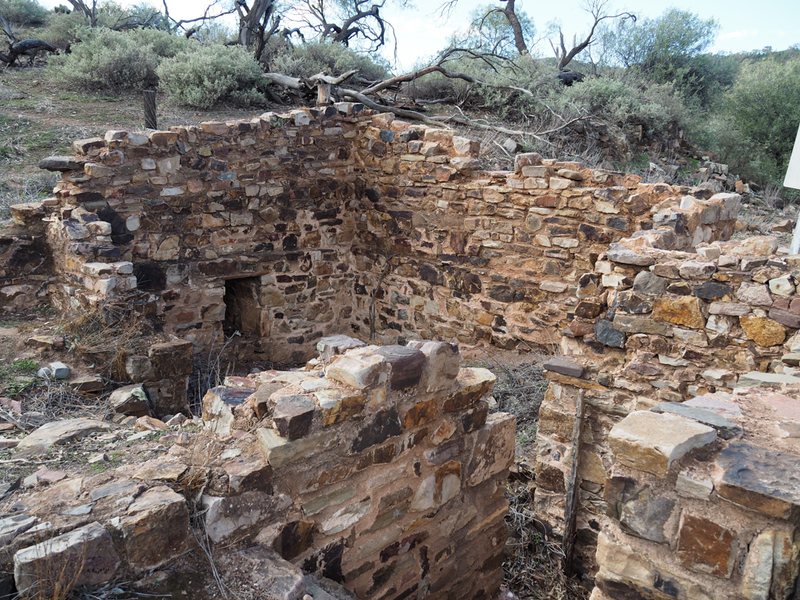 The photo is for the second house foundations and the cellar. 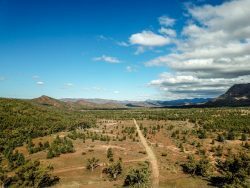 The view down the valley is very good so I put the drone up again in the wind, the highest I have sent it up yet (I couldn’t see it!) 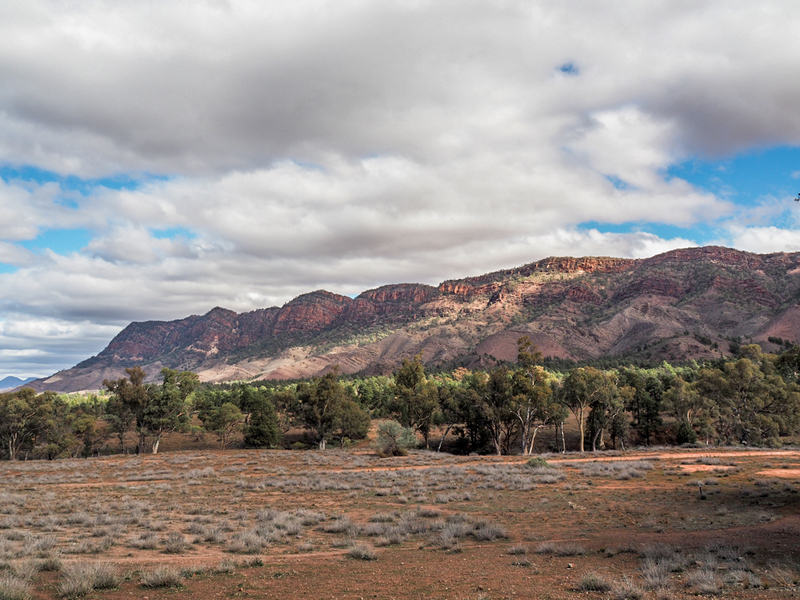 and took a photo down the valley. The view from the house ruins was also good. I guess if you are the first settler you can name mountains. In the range you can see a bluff which is Haywards Bluff, the next peak is South Mt Hayward, and the next Mt Hayward, perhaps he took it a bit to far. 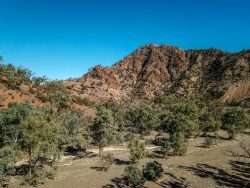 The range is the Heysen range named after the painter Hans Heysen who was the first artist to capture the colours and grandeur of the Flinders. A pug and pine house was built in 1925 in the flats below the old house and Heysen first stayed here in 1926, and he subsequently visited many times. 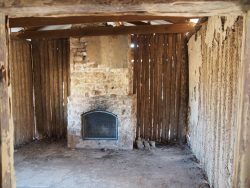 Most of the pug is gone except for a small section to the right of the fireplace, it looks like rendering and is made using fire baked limestone that becomes lime. 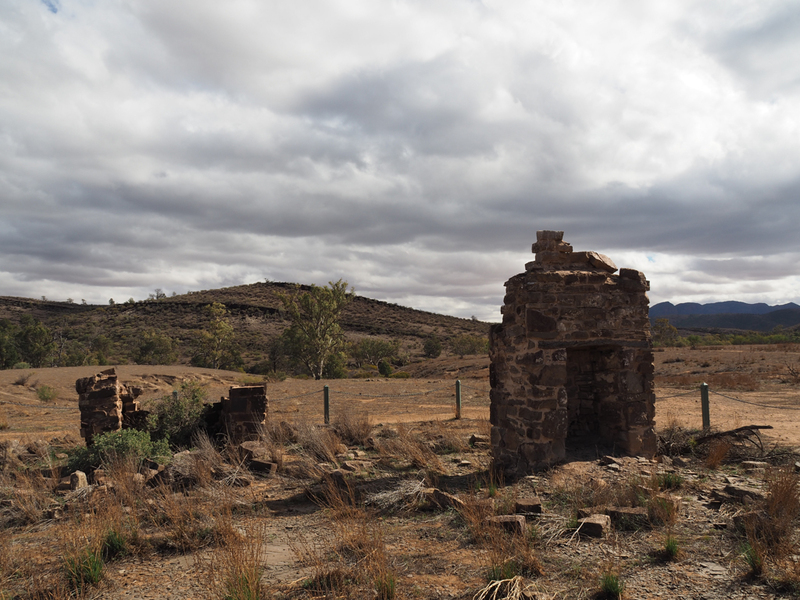 On the way back to Wilpena Pound we visited the ruins of Youngoona Hut, an outstation of Aroona. Shepherds used to stay here to muster stock 4 times a year. 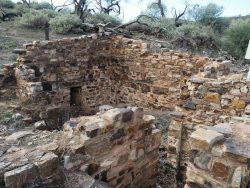 The timber walls have long since decayed but the 2 stone and mud chimneys still stand, well one of them. We had rain and wind late afternoon and night so no fire, we sat in my caravan and did cryptic crosswords. 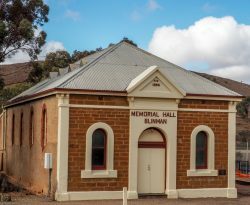 Monday was overcast and cold so Deen drove us to Blinman for a counter lunch, about 60 Km away at the top of the Flinders. 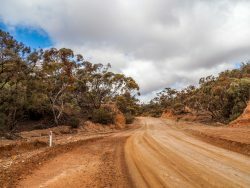 It is an excellent bitumen road all the way. 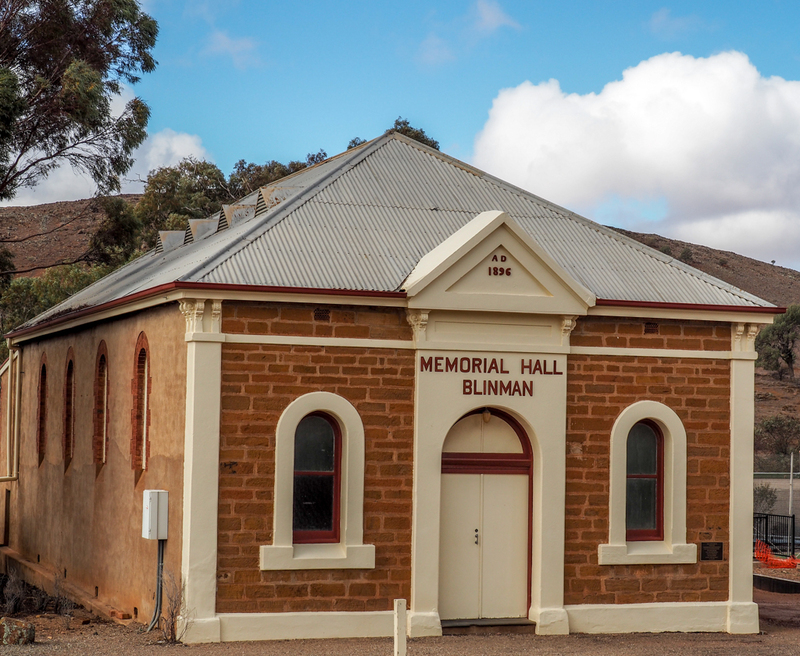 Blinman is an old mining village with some lovely old buildings including the memorial hall dating from 1896. 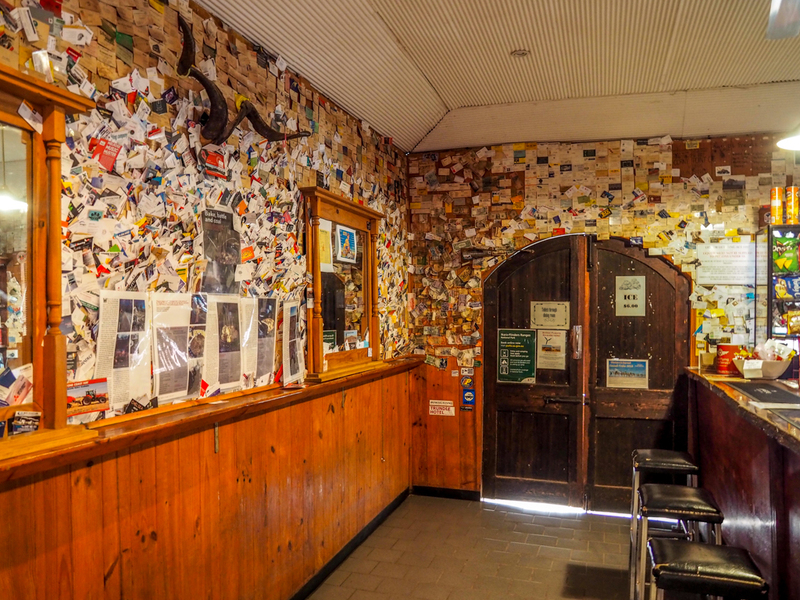 The pub is a classic bush pub and the walls of the bar are covered with countless business cards. 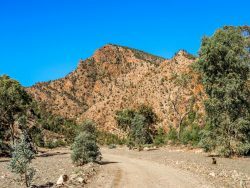 We then headed down Parachilna Gorge road toward Parachilna, a dirt road, in Deens Mini. 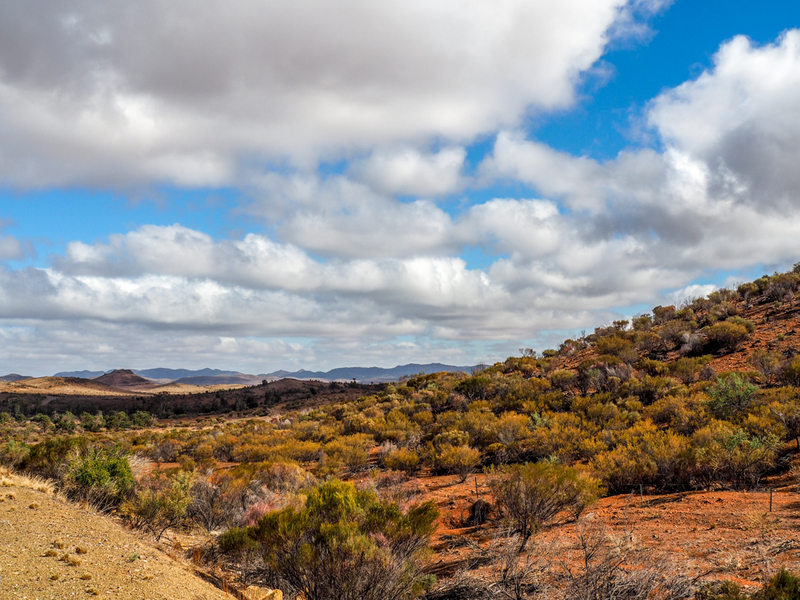 After about 10 Km we decided that the clouds looked too threatening and the road was already a bit wet so we turned around and headed for home. 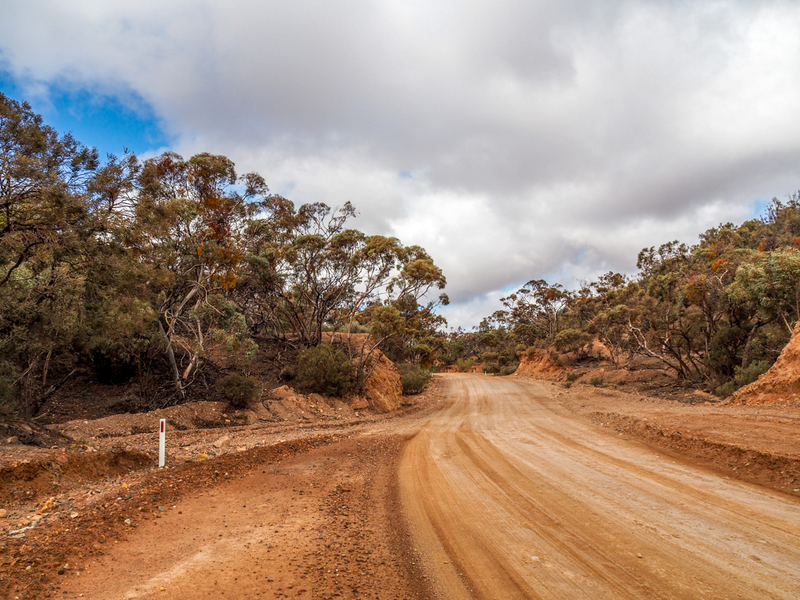 The gorge drive was pretty with lots of Mallee Gums in places. 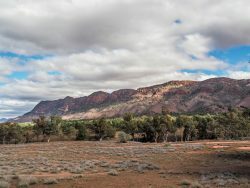 On the way back we had to stop and photograph the view toward Wilpena Pound, but the photos never do the scene justice. By the way if you click on the photo you will get a much larger view which does do the Flinders better justice.